Joseph Stalin, the man who led the building of socialism in the USSR and saved the world from Hitlerite fascism, is to many people an evil, bloodthirsty dictator and tyrant. Anti-Communists everywhere have had a field day demonising Stalin and using the demon so created to drive people from curiosity about, or positive feelings towards, Communism and Communist Parties. Undoubtedly this demonisation has largely succeeded and derived credibility because the most vocal, fiercest critics have worn the cloak of Marxism and Marxism-Leninism. Trotsky spoke as a “Marxist” when he savagely attacked Stalin for adhering to the theory of “building socialism in one country”, for disallowing “democracy” (factionalism) in the Party, and for fostering a bureaucratic caste that took power away from the workers. Following Stalin’s death, the Trotskyite attacks were largely confirmed by Khrushchev, the Soviet leader who succeeded Stalin. Khrushchev delivered a secret speech to the Soviet Party’s 20th Congress in 1956, three years after Stalin’s death. Although the content was kept from the mass of Soviet Party members, it was leaked to a US capitalist newspaper and sent shockwaves through the international communist movement. It accused Stalin of fostering a cult of the personality behind which he cruelly suppressed and killed loyal Bolsheviks in their tens of thousands. Anti-Communists could not conceal their glee. Many Communists were so disheartened and disillusioned that they withdrew from revolutionary activity or adopted the revisions to Marxist theory that Khrushchev passed off as corrections to “Stalinist dogma”. Reactionary authors such as Robert Conquest lapped up the secret speech and produced “histories” that established as “fact” that Stalin had been responsible for mass repressions in which some 20 million Soviet citizens were murdered. The evaluation of Stalin was not all one-sided. Trotsky’s writings had always been contested during Stalin’s lifetime. After the 20th Congress, Khrushchev was criticised by genuine Marxist-Leninists in all Parties. Great assistance was afforded by the Chinese and Albanian Parties and their defence of Stalin. Even so, there was a grudging acceptance that Stalin had made serious errors. Neither the Albanians nor the Chinese had access to Soviet records against which to judge the validity of crimes attributed to Stalin by Khrushchev. The strongest criticism of the secret speech was that it “completely negated Comrade Stalin” whereas “his merits outweighed his mistakes” (On the Question of Stalin, Beijing, September 13, 1963). It was largely accepted among genuine Marxist-Leninists that Stalin was 70% correct and 30% incorrect. In the latter component were departures from dialectical thinking; confusing the two types of contradictions (between ourselves and the enemy, and among the people); conviction of innocent people on charges of conspiracy and counter-revolutionary activity; and certain violations of democratic centralism within his own party and of comradely relations between the Soviet Party and other Communist parties. In only relatively recent years has it been possible to access some previously unreleased archival materials relating to the Soviet Union. By and large, academics working on history of the Soviet era have declined to visit this archival material. The demonisation of Stalin has been so widely and successfully spread that it is not worth risking one’s academic reputation to suggest that there could be a different appraisal. One person who has tapped into the archives is Grover Furr, an American professor of Medieval English literature at Montclair State University. Furr’s first full-length book, Khrushchev Lied (2011) investigates each of the allegations made against Stalin (and Beria) by Khrushchev in his secret speech and provides documentary evidence that establishes their monstrous falsehood. This was followed by The Murder of Sergei Kirov (2013) which undermined the so-called “scholarship” on which accusations that either Stalin had Kirov murdered, or that the murder was the act of a lone assassin, have been based. Using again a mountain of documentary evidence, Furr showed that Kirov’s assassination was planned and carried out by a group loyal to an anti-Party clique headed by Zinoviev and others, and with ties to Trotsky. The following year, Furr published a lengthy refutation of Timothy Snyder’s widely-read Bloodlands which had equated Stalin with Hitler and blamed both for the slaughter of millions in the Ukraine, Byelorussia and Poland. It is worth giving the full title of Furr’s book: BLOOD LIES: The Evidence that Every Accusation against Joseph Stalin and the Soviet Union in Timothy Snyder’s Bloodlands Is False. Plus: What Really Happened in: the Famine of 1932-33; the “Polish Operation”; the “Great Terror”; the Molotov-Ribbentrop Pact; the “Soviet invasion of Poland”; the“Katyn Massacre”; the Warsaw Uprising; and “Stalin’s Anti-Semitism”. Furr looked into every source cited by Snyder, and checked every one of his footnotes to produce a credible argument that Snyder was dishonest throughout his book. A year later (2015) came Trotsky’s “Amalgams.” Trotsky's Lies, The Moscow Trials As Evidence, The Dewey Commission. (Trotsky's Conspiracies of the 1930s, Volume One). Trotsky’s own archives, as well as Soviet era archives, served to establish that he had maintained contact with Zinoviev, Kamenev and Bukharin and that the assassination of Stalin and other top Soviet leaders was the object of their conspiracy. Given the successes of the First Five Year plan and Stalin’s and the Party’s great popularity with the people, this was the only way that Trotsky and other oppositionists could come to power. Returning for a moment to the 70-30 evaluation of Stalin held by the Chinese and many other genuine Marxist-Leninists, a specific criticism of errors by Stalin was the following: “in 1937 and 1938 there occurred the error of enlarging the scope of the suppression of counter-revolutionaries” (On the Question of Stalin). Indeed, there was a sharp increase in the execution of alleged spies, conspirators and counter-revolutionaries during these two years. 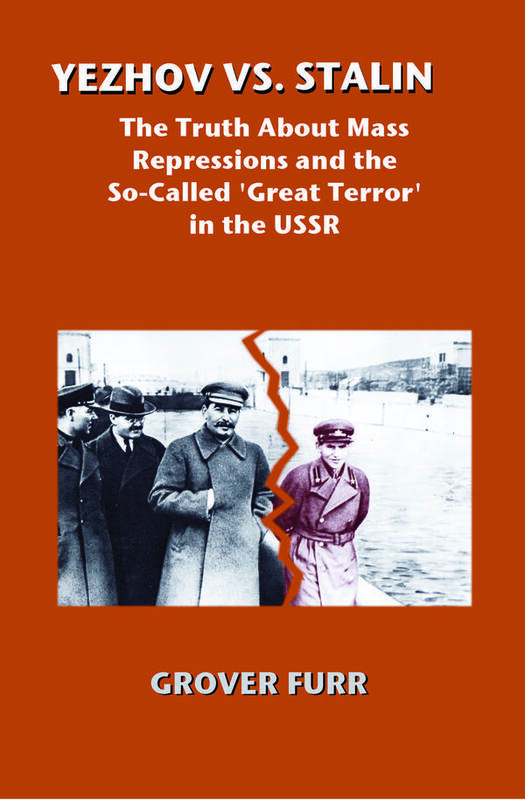 Yet, argues Furr in his latest book, Yezhov vs. Stalin: The Truth About Mass Repressions and the So-Called ‘Great Terror’ in the USSR (2016), Stalin was unaware of the scale of the repressions and not responsible for Yezhov’s private war on loyal Party members and Communists. Furr presents Stalin as determined to restrict the power of the Party bureaucracy by introducing through his 1936 Constitution a provision for multicandidate secret ballot elections. This, together with a guaranteed right to recall elected officials who had lost the confidence of their electors, was designed to show working people world-wide that the dictatorship of the proletariat was the most democratic system of government, and far superior to anything that bourgeois democracies practiced. However, the powerful regional First Secretaries and other top officials frustrated and opposed Stalin’s attempted democratisation and, fearing the electoral influence of thousands of kulaks and others released from state prisons in 1935, quietly acquiesced in Yezhov’s claims of a revived widespread conspiracy requiring new repressive measures. When the scale of Yezhov’s criminal activity became known to Stalin, he had him arrested and replaced by Beria who brought the repressions to an end. • Stalin was a “dictator”. Therefore, he either initiated or could have stopped everything important that occurred. Therefore, whatever happened, happened because he wanted it, or something very like it, to happen. Stalin was always “in control”. • The alleged conspiracies against the Stalin government were all fabrications. None of them really existed. • It follows that the evidence produced in the testimony at the Moscow Trials, and in the interrogations and confession statements that have gradually been published since the end of the USSR in 1991, must be fabrications, and so are disregarded. • Stalin never wanted democratic elections. The struggle by Stalin and his supporters for contested elections to the soviets (the legislative arm of the Soviet government) was either a sham or intended as a mechanism to get rid of entrenched local leaders whose power Stalin perceived as threatening in some way. But “almost impossible” is not the same as “completely impossible”. The mass reappraisal and appreciation of Stalin will not take place overnight, but take place it will. History will be kinder to Stalin than to the Trotskys, Khrushchevs, Conquests and others who use a straw man, a caricature, a demonised Stalin, to attack and oppose the Communist alternative to capitalism. And it will record the debt it owed to Grover Furr for pioneering this reeavluation. Furr’s book is available from Erythros Press. As an alternative to purchasing the book privately, those who are interested in Furr’s books, and who are members of their respective State or local libraries, might like to suggest the library purchase the book, thus helping to make it available to a wider audience.